A common characteristic of white supremacy is pitting oppressed groups against each other. This is currently happening with a media uproar attacking the Women’s March, citing anti-semitism, bigotry and hatred in their leaders. This couldn’t be further from the truth. I know this because I’ve experienced it first hand. 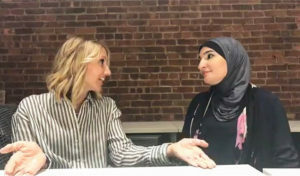 One of the 4 national leaders of the inaugural women’s march is Linda Sarsour, pictured here with S and I after we did a Facebook Live on “Daring Discussions” in the Fall of 2016. (Yes, S participated). 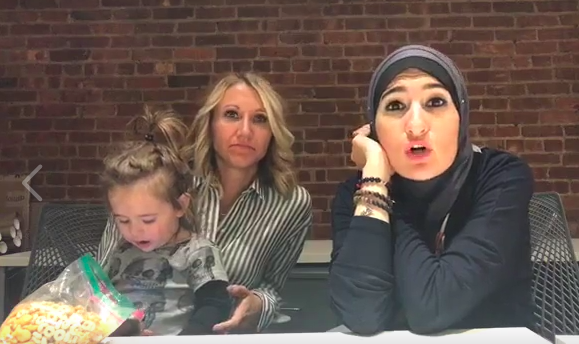 I’ve stood with Linda in below freezing temperatures against the Muslim ban, (at which time she found hand warmers for my babies), sweated with her in DC getting arrested in a witness against family separation, and marched with her for black lives, immigrants, womxn, transgender people, and yes, our Jewish sisters and brothers. 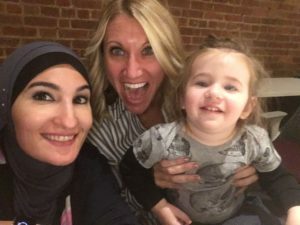 It breaks my heart that this fierce, brilliant, compassionate and ever justice seeking Palestinian Muslim Brooklyn born and bred mother of three is continually attacked. But it’s not too surprising. She is the antithesis of “making America great.” This Thanksgiving season, I am deeply grateful for the vast ways Linda fights for ALL OF US. Yes, even you, and I’m imagining conversations that will move us towards discovery and away from fear. (See helpful articles on this below). Thanksgiving is upon us. A time when many of us will gather around table. 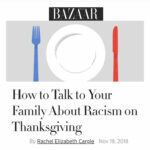 Will we give lip service to formality and graciously nod and smile to cousins, aunts, uncles, siblings, and parents, even if they are the very ones with whom we disagree? Probably so. And we will cite time, politeness, and uselessness as excuses. I know I will. But I’m striving to have more of the hard conversations — especially with those who are closest to me — and I’m striving to do so with an umbrella of openness and understanding. Or, if you’re in the New York area, Middle Collegiate Church is offering a free Transforming Difficult Conversations Workshop on Tuesday, November 27th — RSVP here! I’m grateful for these resources, leaders like Linda who pave the road for difficult conversations every day, and the chance to try some of this out myself. What about you?